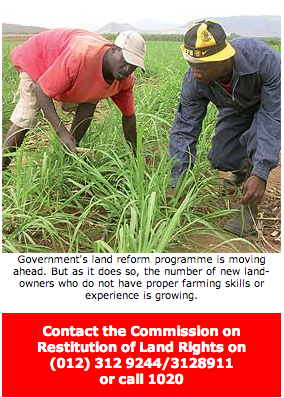 New land-owners must have special skills if they want to make a living from their farms. To help them, government has different programmes to develop their skills and keep their land productive. One plan gets companies and interested parties with experience and knowledge to help train new farmers. "They form joint projects with the local communities, teaching them new skills," said Land Affairs and Agriculture Minister, Lulu Xingwana. She said previous owners of farms who were prepared to help teach new owners were also part of this plan. In KwaZulu-Natal, for example, a previous farm owner who has the necessary experience and knowledge agreed to help new owners to keep the land productive. The previous owner entered into a 10-year agreement with the community. They appointed a committee that works closely with him to see first-hand how the farm is run. In this way they learn how to farm productively, while getting business and management skills. When the contract ends, the community should be able to stand on its own feet and run the farm on their own as a successful business. During a recent land hand-over ceremony in Brits in the North West, the Agricultural Department, said the department was building relationships with previous land-owners for skills training. Chief Land Claims Commissioner, Tozi Gwanya, said the Commission on Restitution of Land Rights keeps looking for ways to help new owners use their land in the best possible way. He said some new land-owners preferred to get money for their land. This is because they had already settled somewhere else and it would be difficult to start over at a new place. "But we encourage beneficiaries of the land reform programme not to sell their properties for at least up to five years after receiving it," he said. "We ask them to rather rent out their land to people who can use it well. 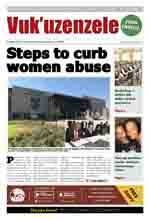 In this way the community would still benefit from their land without selling it and losing it for good," he said.